Hunter x Hunter: Phantom Rogue Review – AiPT! A great addition to HxH lore, even if it’s not canon. Hunter x Hunter is one of my favorite anime/mangas ever, so when I was given the chance to review the new English release of the first original movie, I jumped at it. However, Phantom Rogue is not ‘canon’ — it’s an original story that is not adapting any of the manga, but unlike the other Hunter x Hunter movie, The Last Mission, it attempts to tie into the story to some degree. Taking place after the ‘York New City’ arc (that translates to season three for those who watched it on Netflix or DVD), Phantom Rogue centers around the fallout of that arc and brings into the fray a new character, Omokage, who was once a member of the Phantom Troupe. Visually, the animation looks exactly like the anime without any downgrade in quality. Sometimes in original anime movies, that’s not the case (*cough cough* The Last Mission), but Madhouse remains one of the best animation studios in the business, and Phantom Rogue has many fluid and striking sequences. The music used in Phantom Rogue is all just previous music from the series, but I always have to mention how great the score for HxH is. I’m usually a sub kind of girl when it comes to anime, but I decided to go with dub for this watch-through because that’s really the selling point of this DVD release. The voice work is similar to that of the ongoing Hunter x Hunter dub, and it’s nothing to sneeze at. All the voices sound natural, and they even transcended what I was expecting, especially coming from the VA’s for Kurapika, Hisoka, Omokage, and Killua. Kurapika’s VA in this and the ongoing dub is probably one of the best parts of the dub. 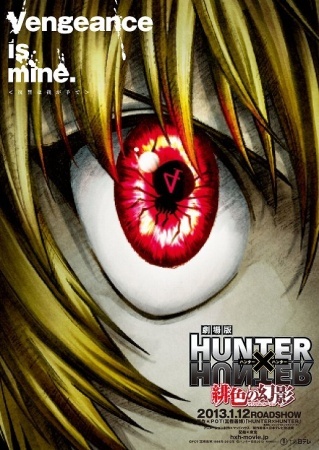 She really has Kurapika’s cadence and emotion down to an artform, and I can’t help but want Kurapika to have more time in this as she’s just phenomenal. The story enriches HxH lore and adds a level of continuity to the rather weird transition between the ‘York New City’ and ‘Greed Island’ arcs. Omokage is certainly not the series’ best villian, but he’s not as bad as the bombers in Greed Island. Retz isn’t a great addition to the series’ roster of female characters, despite the interesting attempt to live as she chooses rather than as her brother puppeteers her to live. In the end, she ends up feeling bland, and you can tell she wasn’t written by Togashi, as Togashi always takes more care to make characters interesting and varied, which Retz is not. The series’ regular characters are written very well, and in that respect they do feel like their canon counterparts. Killua and Kurapika have always had more in common than the series would like to show us, and out of the relationships between the main four, they are definitely the least developed in the series. This makes the interaction towards the end, where Kurapika is about to use Chain Jail on Omokage and Killua cuts in to say he will kill Omokage because Kurapika doesn’t need more blood on his hands, a great moment that I would like to see more of in the ongoing series. The use of the canon bonus chapter with Kurapika’s backstory and the use of his childhood friend Pairo as one of Omokage’s puppets were both inspired decisions. I can’t say the same for the use of Illumi as the puppet to counter Killua. It was repetitive and basically just the same scene from the ‘Chimera Ant’ arc where Killua takes Illumi’s mind control pin out of his head, but like over and over and over again. We get it, Illumi is a sucky big brother, and if I have to hear the phrase “never fight a superior opponent” again, I will scream. The extended sequence where Killua contemplates suicide because Gon lost his eyes was probably something that would happen in canon but in this it felt drawn out and overwrought. Gon and Leorio have always been the less interesting of the main four for me, and this didn’t really do a whole lot to build on their characterization. Leorio is delegated to the sidelines for most of the big fight (when is he not though?) but his interaction with Kurapika, where he says they’ve both lost friends but they need to take that loss and build on it with new friends, was quite poignant. If only Kurapika would take this to heart and answer his damn phone once in a while. Overall, I would recommend this to anyone who is reading/watching the series or has already finished the series. The voice acting and animation is solid, and while it’s not as complex as some of the stories in the main series, it still adds to the story and characters and in the end is not an empty effort. Definitely good if you want more and don’t want to read the irregularly updated ongoing manga chapters. Hunter x Hunter: Phantom Rogue is a great addition to HxH lore, even if it's not canon. Great voice acting, espically from Kurapika's VA. Builds upon things that will probably never be addressed in canon. So much better than The Last Misson. The original characters are not as varied and well written as a HxH character should be. Illumi's puppet is repetitive to an annoying degree.